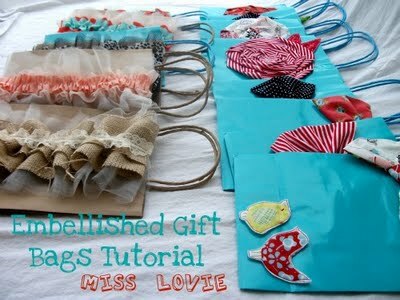 If you like to dress up your gifts with more than just standard wrapping paper, you will love this fun tutorial from Miss Lovie. She has a ton of fun ideas for dressing up an inexpensive gift bag. Everything from ruffles and bows to flowers and applique. You can check out all of her cute ideas HERE.